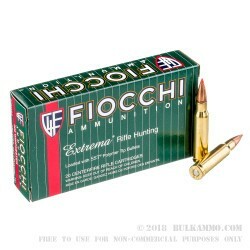 This Fiocchi 308 Winchester ammo with 150 grain SST or Super Shock Tip is part of Fiocchi's Extrema Rifle Ammo line-up. Besides being topped with the Hornady 150 grain SST bullet, the rounds have heavy walled, reloadable, non-corrosive Boxer primed brass cases. They have a muzzle energy of 2650-foot pounds and a muzzle velocity of 2820-feet per second. These cases of 200 cartridges are packed into 20 round boxes and the case comes with 10 boxes. 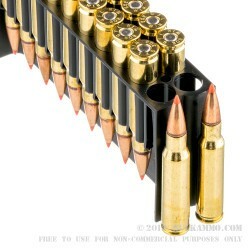 These loads are an ideal choice for a day at the range or a hunting trip. Get yours now. 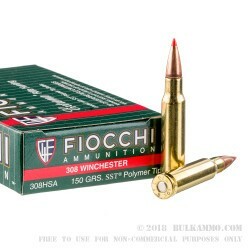 In 1952, the .308 Winchester cartridge first graced the ammunition world with its presence. Shortly thereafter, NATO adopted the 7.62x51mm cartridge as a battle rifle round, followed by the 308 being brought to the firearms and ammo market by the team at Winchester. 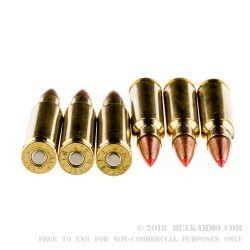 Since then, the .308 caliber round has exceeded many other cartridges in its variety of bullet types, grain weights, and the massive variance in overall configuration available for the famous .30 caliber load. Traditionally used for hunting deer, elk, and larger North American game, the 308 Winchester loading is easily the most popular cartridge in the world. Its popularity is owed to its multiple role adaptability and versatility in the military and civilian classifications.